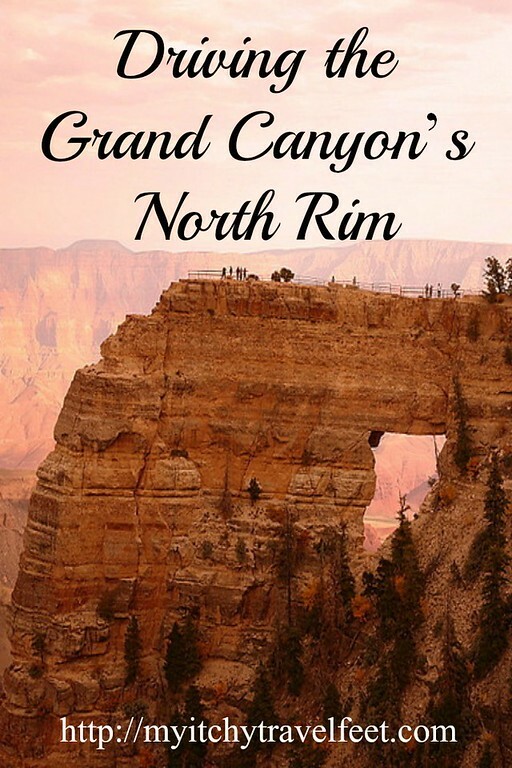 Updated 04.05.2019: If you’re a long time reader of My Itchy Travel Feet, then it’s no secret that the North Rim is my favorite destination at Grand Canyon National Park (Alan’s too). We appreciate the isolation, as well as fewer folks crowding the overlooks. One of the easiest—and most scenic—ways to explore this side of the “big ditch” is taking the 23-mile-drive from Grand Canyon Lodge to Cape Royal. 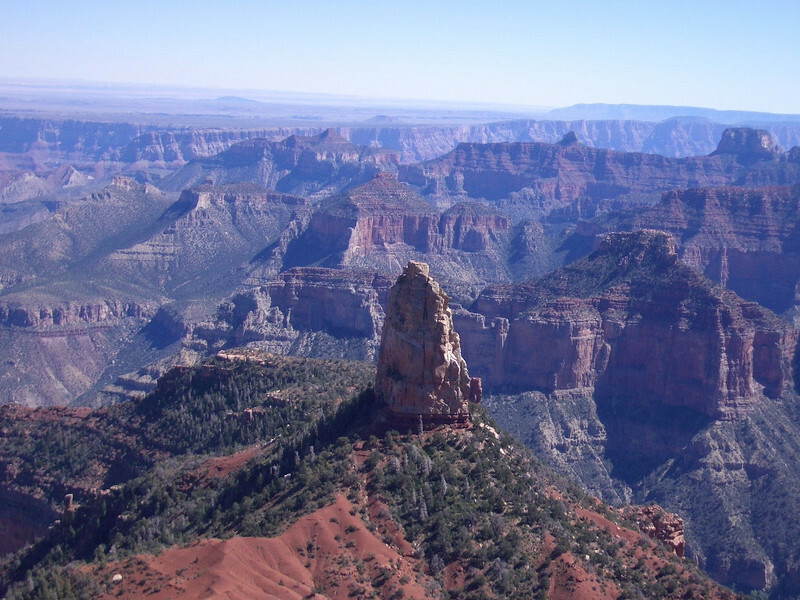 It’s a great first look at what the North Rim of the Grand Canyon has to offer during it’s operating season from May 15 to October 15. Boomer travelers will discover plenty of scenic pullouts on this off-the-beaten-path national park experience. It’s one way to avoid the crowds of the very popular South Rim of the Grand Canyon. But don’t just park the car and look. Take time to hike the trails that also lead to grand views. Starting at the North Rim Entrance Road, the paved road to Cape Royal travels through a mixed forest of ponderosa pine, douglas fir and quaking aspen. In autumn—the best time to visit in my opinion—the golden leaves of aspen trees shimmer when the wind blows through the forest adding to the already spectacular scene. This is a road for savoring—and the speed limit is mostly 35-miles-per-hour—so relax and enjoy the drive. Rather than a quick road trip to Cape Royal, spend a full day driving, taking short walks on the trails and stopping at the many viewpoints. Be sure to bring a picnic lunch! After about 5 miles, you’ll arrive at an intersection, Cape Royal Road veers to the right. 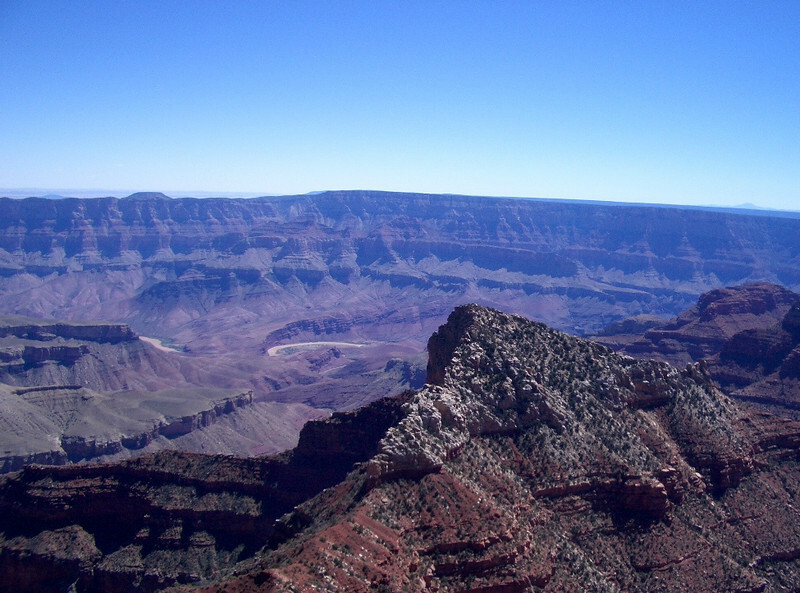 However a jog to the left travels 2.7 miles to Imperial Point, the highest overlook on the North Rim at 8,803 ft. Although the road travels through a forest fire burn area, the view at Imperial Point, especially of the Painted Desert, is worth the drive. Back on Cape Royal Road, it’s several more miles of driving before the spectacular views appear. Vista Encantada Picnic Area is a fine place to stop. If it’s too early for lunch, keep it in mind for the return drive. You’ll be hungry by then. The Vermilion Cliffs in the distance make a pretty vista to any sandwich. Roosevelt Point is the next overlook. Named after President Theodore Roosevelt, from the viewpoint you’ll see the confluence of the Colorado and Little Colorado rivers. Are you ready to stretch your legs, yet? From the Cape Final Trailhead parking lot, take the two-mile hike to the viewpoint at Cape Final. Keep on driving because the views just keep getting better. At Walhalla Overlook, you’ll see the Colorado River far below as it twists and turns through the Grand Canyon. And now you’ve reached the end of the road and the best views on the North Rim of the Grand Canyon. After parking in the gravel lot, walk the paved side trail to Angel’s Window. 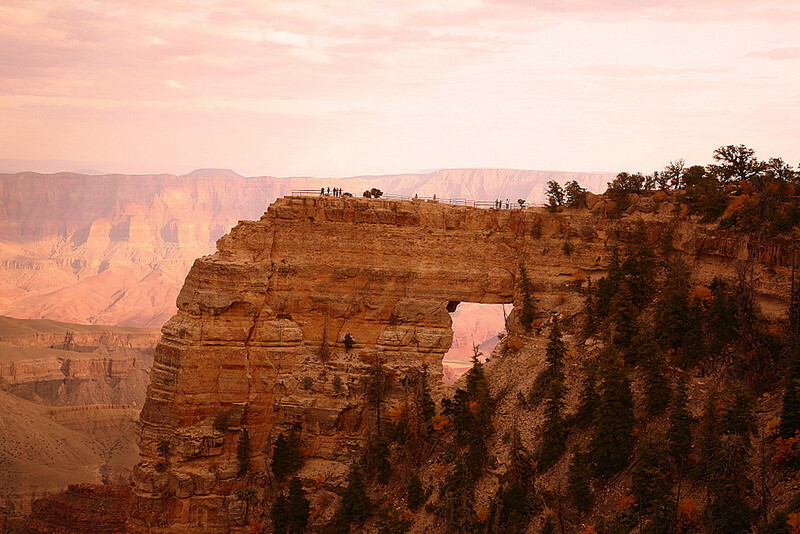 You’ll be standing on a Kaibab limestone arch overlooking the canyon. That’s the Colorado River 5,000 ft below. Alan took this photo of Angel’s Window while on a second visit to the North Rim. I think he was practicing with filters, which explains the golden glow. Do you see the guardrails and silhouettes of visitors walking on top? Another paved trail leads to the southernmost overlook on the North Rim—Cape Royal. Spend time admiring Vishnu Temple or Wotans Throne. 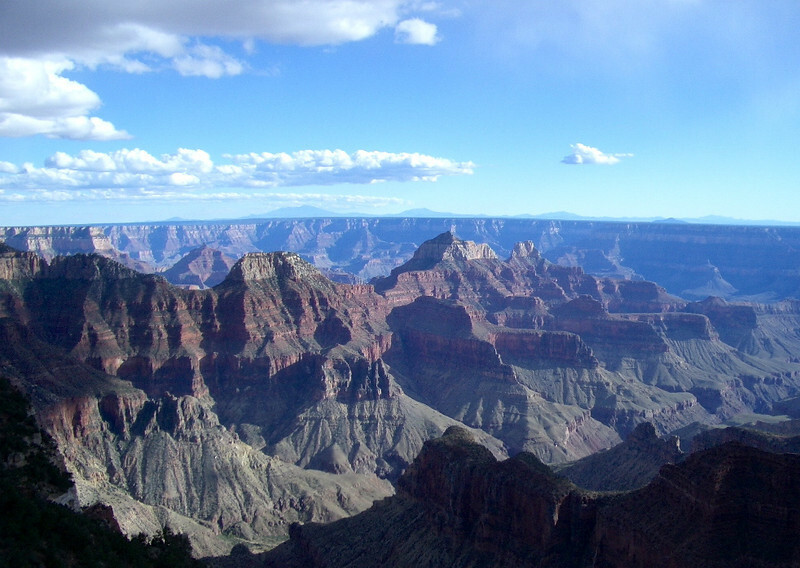 You’re gazing at one of the most beautiful scenes in Grand Canyon National Park. If you’re up to it, visiting at sunrise or sunset is a beautiful way to begin or end your day at the North Rim, especially for photographers. You’ll appreciate this scenic driving experience on the North Rim. Turn it into a day-long trip filled with hikes, photography stops and a picnic lunch with a million dollar view. 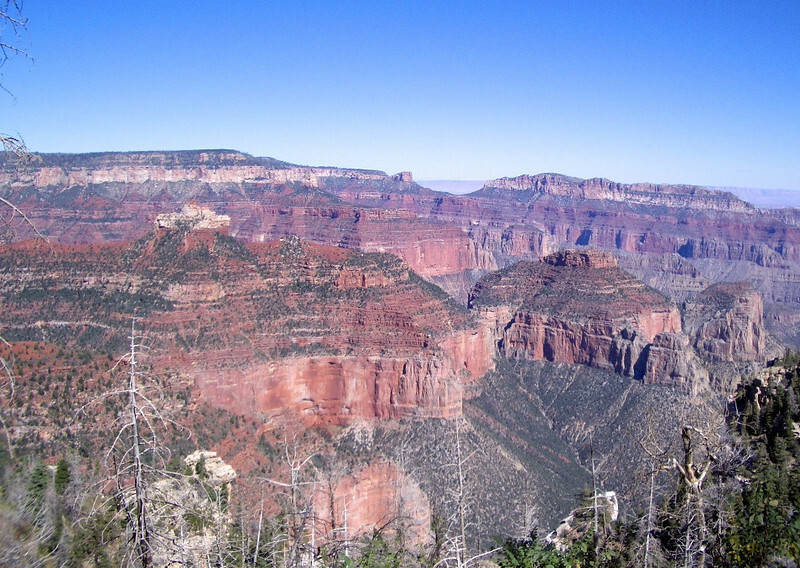 Are you planning a trip to the Grand Canyon’s North Rim? Start your trip preparations at our National Park Travel Planner.